Individual formatting for your text. 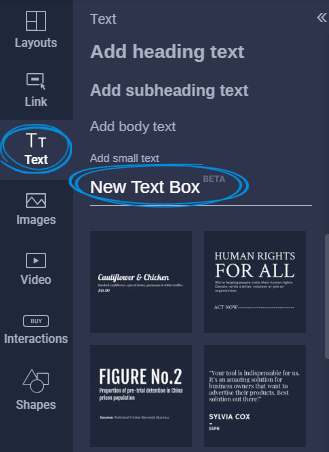 With our New Text Box, you can now change the color, opacity and size individually for each word or letter in your text and also edit the line spacing, line height and whether you want the text to be upper case, lower case, underlined or striked through. 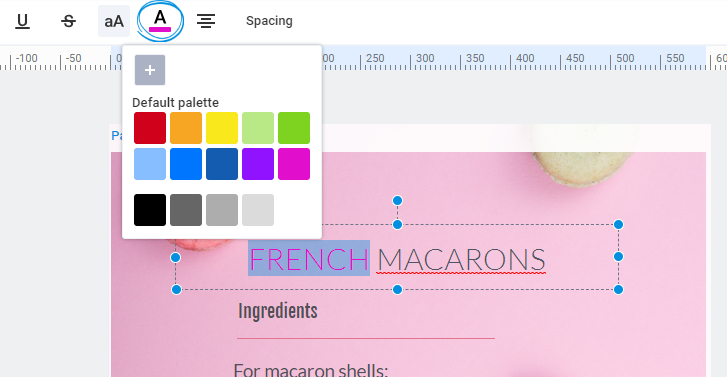 Important: Individual formatting is not available for the existing templates since they were created before this feature. You can currently only do that with the New Text Box. 8. Select the letters you want to change into lower or uppercase then click on the Uppercase (aA) button at the top of the editor. 9. If you want to strike a word or a few letters, simply select the word or the letters then click on the Strike through button at the top of the editor. 10. Select the word or letters you want to underline and click on the Underline button at the top of the editor. Disclaimer: This is a Beta feature. If you encounter any issues while using it, please contact us via live chat.